Brisbane’s Courier Mail newspaper has obtained a secret list of people, places and events nominated by Queensland politicians as icons of the state. The list is being prepared as part of Queensland’s 150th anniversary celebrations. From the initial list of 700, a bipartisan panel of MPs will attempt to trim the list to 300 which will then be put to a public vote. The top 150 will be formally acknowledged during the state’s Queensland Week celebrations. Actress Babette Stephens, who was also a panelist on Brisbane game shows in the 1960s and also starred in Brisbane’s first soap opera drama Until Tomorrow in the 1970s. Pop group The Bee Gees, who rose to fame on early variety shows in Brisbane before appearances on national shows such as Bandstand. Actor William McInnes, from TV dramas including Seachange, Blue Heelers, Marshall Law, Curtin, East West 101, The Shark Net and comedy series Kath & Kim. Wally Lewis, former rugby player and now sports presenter for Nine News in Brisbane. Vilma Ward, morals compaigner, media commentator and panelist on daytime TV programs including Bailey And The Birds. Mt Coottha’s TV transmission towers. Jacki MacDonald comes to mind as a glaring omission. 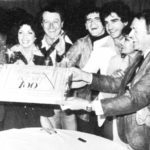 A winner of a swag of TV Week Logies for most popular personality in Queensland and a TV career that has included all three of Brisbane’s local commercial channels as well as a national profile through Hey Hey It’s Saturday and later Healthy Wealthy And Wise. 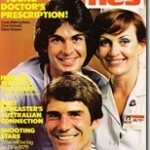 Rowena Wallace, who first rose to national fame in the 1960s drama You Can’t See Round Corners, followed by The Rovers, Division 4, Number 96, Cop Shop, Outbreak Of Love, Prisoner and, most famously, as vicious ‘Pat the Rat’ in Sons And Daughters – a role that won her a TV Week Gold Logie in 1985. Kerri-Anne Kennerley (pictured), back when she was Kerri-Anne Wright was a child star of Brisbane television in the 1960s and 1970s before featuring in the soap opera The Restless Years and later becoming co-host of Network Ten‘s Good Morning Australia, where she stayed for over a decade and went on to further success in daytime TV as host of Midday in the late 1990s and Mornings With Kerri-Anne since 2003. Sigrid Thornton, from early days in Homicide, Father Dear Father and Prisoner, later becoming famous for her roles in historical dramas such as All The Rivers Run, 1915 and Paradise before taking the lead role in ABC‘s Seachange in the late 1990s. Reg Grundy (pictured), while not born in Queensland the former radio announcer turned game show host got his big break as a producer of game shows in Brisbane in the 1960s, forming the basis for what became a global empire. Gerard Kennedy, actor from early crime shows Hunter and Division Four and later in historical dramas Tandarra and Against The Wind. Most recently seen in the Nine Network series Underbelly. 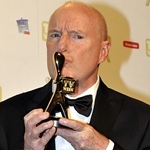 Winner of two TV Week Gold Logies. Ray Barrett, accomplished television, stage and film actor with recent roles in Something In The Air and After The Deluge. Don Seccombe (pictured), long-serving newsreader for QTQ9 and host the game show I’ve Got A Secret which ran for ten years. Hugh Cornish, one of Brisbane television’s earliest on-air personalities as well as general manager at QTQ9. Newsreader Brian Cahill who read the news for many years at BTQ7, later at QTQ9 and then TVQ0 before moving into politics. Then there are current-day local TV identities who have long histories in television. Names such as Kay McGrath, Bruce Paige, Frank Warrick, Heather Foord and Sharyn Ghidella. Who do you think is worthy of a mention on Queensland’s top 150 list? I never realised even 1/3 of them were Banana-benders! That’s a serious pool of talent there, surprised more of them haven’t been nominated for the 150th celebrations. 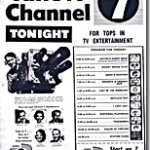 One icon, which should be on that list, is… The slogan that defined Ch 7 in Queensland during the 80’s, Love You Brisbane. Brisbane Extra- Survived the national axe in 1992, and has become part and parcel of Brisbane viewing.